The objective of this review was to provide an overview of new developments and innovations within the collections industry that could possible enhance the performance of collection agencies, specifically in South Africa. A literature study was conducted to determine current practices in the collections industry, as well as possible future innovations. A significant trend identified throughout the literature study was the increasing prioritisation of automated digital communication in several aspects of debt collection. It is reasonable to assume that this trend will continue to become the industry standard. Four recommendations are made based on the findings of the literature study. Firstly, South African collection agencies should investigate the feasibility of developing an app-based solution to performing collections. Secondly, collection agencies should supplement traditional modelling techniques with other tools, such as those developed in the field of machine learning. Thirdly, collection agencies could consider using speech analytics to obtain insights into call centre agents' performance and adherence to business rules. Lastly, the usage of social media data in collections as well as credit risk modelling in general is recommended as a topic for future study. • A review of the various techniques currently employed in the field of debt collections may serve as useful reference for both academics and those working in debt collections. • Recommendations are provided to assist businesses in aligning the operational models of their debt collection units to industry best practice. • Topics for future research in this crucial sector of the economy, which brings together such fields as risk governance, predictive modelling, human psychology, debt management, legal compliance and business analysis, are provided. Collections agencies normally act as external debt collecting agencies for a diverse selection of institutions that may, during the normal course of their operations, encounter defaulters. These defaulters have breached their legal requirements and failed to fully repay the debt extended to them. This scenario may have several adverse effects on the company - the two most direct being a financial loss and the opportunity cost of the capital extended to the debtor. Debt collection is the process of trying to minimise these losses by recouping some of the debt. Companies may choose to make use of internal or external debt collection strategies, or a combination of the two. It is usual that external debt collectors receive those debtors who have proven unresponsive to internal collection efforts. Debtors referred to external collectors usually differ significantly in their repayment characteristics from those who respond to internal efforts. It has been shown that the difference can be as extreme as 10% non-payers for internal collections versus 83% for external collections, and 30% full repayments versus 0. 7%, respectively. 1 Thus, with such a low probability of collecting on outstanding debt, it is critical that the collections process be as efficient as possible for external debt collectors to operate profitably. • machine-learning techniques capable of modelling and improving the collections process. We aimed to provide South African collection agencies with innovative thinking and strategies. 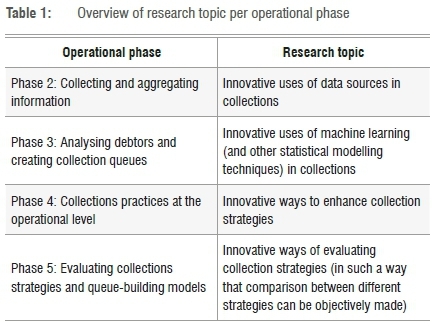 From a brief review of the collection process, we identified four areas that became the focus of our research: (1) innovative uses of data sources in collections; (2) innovative uses of machine learning (and other statistical modelling techniques) in collections; (3) innovative ways to enhance collection strategies; and (4) innovative ways to evaluate collection strategies. The collections process is described briefly. Debtors purchase products or services on credit. Those who default on their repayment and are not collected on by internal collections are amalgamated into debtor lists. These lists are then provided to collection agencies which combine the information contained therein with additional data sources to create collections queues. Collections agents are assigned to these queues with the aim of recovering as much of the debt as possible. Collection agencies typically levy a commission on the recovered debt and pay over the remainder to their clients. The collection process is demonstrated visually in Figure 1. Our research will focus on the four main operational phases in this collection process. The first of these, receiving the debtor lists, is not elaborated upon specifically, but research pertaining to the other phases was conducted. This critical operational phase pertains to the collection and aggregation of information on those individuals on the debtor list. Several data sources can be used during this phase. Traditional data sources include data from the clients and credit bureaus. Additional data sources are summarised below. 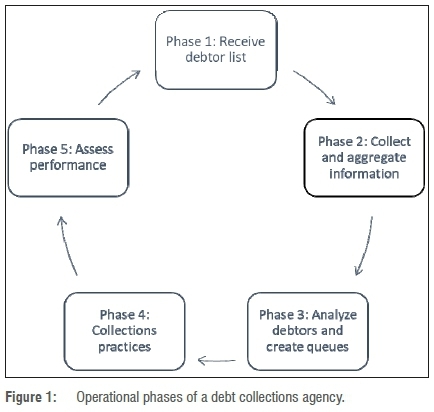 This phase involves the analysis of debtors and then creation of collection queues. Based on a specific collection strategy, a call agent can be assigned to a specific group of debtors, that is, a queue. This queue may also include a prioritisation of debtors. In this phase, the data collected during the previous stage are used as inputs to a chosen model. Typically this model should return scores of individual debtors. This score should, at a minimum, provide a collection agency with estimates of the likelihood of obtaining a promise-to-pay, the conversion thereof to recovery-rate and expected amount collected, the likelihood of zero payment as well as expected collections cost and the expected collections period. It is important to note that the above aspects may be modelled separately or jointly, and that several different models can be used, and each has its own respective strengths and weaknesses. Consequently, traditional methods can be complemented by techniques from other fields such as machine learning. The collection queues are then created using the scores as generated by the model. Logically, higher scores should be associated with better repayment behaviour and thus higher operational profit. During this phase, the output from the previous phase is used to assign collection queues to agents, who attempt to recover as much of the debt as possible. The collections strategy becomes effective during this phase, as it determines the communications method used and provides guidelines for agent interaction with debtors. A holistic collections strategy might also contain recommendations regarding write-off of debtors, as well as the method whereby agents are assigned to queues. This phase occurs concurrently with all the other phases and involves the monitoring of each phase whilst identifying possible irregularities and inefficient strategies. The performance of strategies and models should be assessed regularly and corrective measures taken as and when necessary. Collecting data on strategy performance will allow management to make data-driven business decisions and optimise operational efficiency on many fronts. It is critical that the evaluation methods be established up front and be applied consistently. As our aim was to identify emerging practices, our research was not restricted specifically to the collections industry. Several possible new strategies and ideas emerged in the broader financial sector. It is reasonable to assume that companies might also be hesitant to publish extensive technical details pertaining to their internal systems, as considerable resources are spent developing these systems and companies will want to protect their investments. Business and academic publications were used, as they tend to have different focuses: academic publications contain more theoretical and technical details whilst business publications focus on operational implementations and business results. Case studies were preferred to highly theoretical publications as these address 'real-life' scenarios and report proven results. Note also that these case studies - specifically those from vendors - are perhaps less reliable, as they are not subject to peer review and exist primarily to serve as marketing tools; the results reported can reasonably be assumed to be biased and selectively chosen to reflect positively on the respective business. In each of these four operational phases, specific research topics were identified as shown in Table 1. The rest of the paper will be presented around the research topics listed in Table 1. During the research process, several different data sources were identified that could be used in the collections industry. The main data sources identified are listed in Table 2. It is important to consider that not all these data might have significant predictive power, and it is recommended that the predictive power be investigated before inclusion in the queue-building models to prevent unnecessary inflation of the data's dimensionality. The usability of these data in terms of current legislation should also be considered - there are rich sources of data which are precluded from use in collections strategies in terms of existing legislation. Social media data vendors, like Datasift and GNIP, provide services such as aggregating data across multiple social platforms (Facebook, LinkedIn, Twitter, etc. ). Communication with Datasift suggests that privacy laws restrict the use of individuals' data. Only publicly available data may be used under these laws and the ethical implications thereof should be considered. Datasift3 offers the provision of data starting at costs of USD15 000 per month. GNIP4, a daughter company of Twitter, provides packages of one million tweets, with prices starting at USD1250. A possible application is to link a collections strategy to debtor interaction with social media, i. e. the debtors might be more receptive after interaction with agent correspondence. Step-by-step guides5 have been published which describe methods to search and extract the social media data based on the criteria specified by individuals on popular social networks like LinkedIn, Facebook and Twitter. Ultimately, the goal is still to link customer behaviour with propensity to pay and selection of collections strategy. 5 Web structure mining, web content mining and web usage mining are three methods discussed in Pottharst6 to extract data from any site in general. Another innovative use of data in collections is the utilisation of geo-location data (inferred from cell or mobile phone data, or from Facebook etc. ). 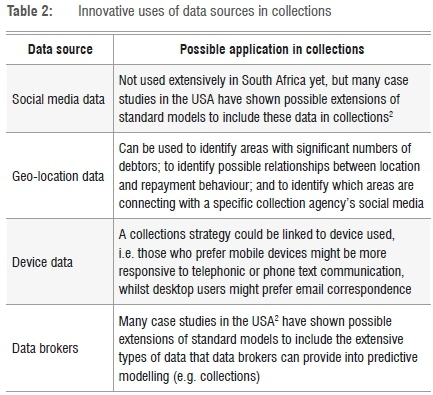 Possible applications of geo-location analysis to collection agencies include: identifying areas with significant numbers of debtors; identifying possible relationships between location and repayment behaviour; and identifying which areas align with a specific collection agency's social media footprint. The possible use of device data should also be investigated as inputs to the queue-building models. A collections strategy could be linked to preferred device, i. e. those who prefer mobile devices might be more responsive to app-based communication whilst desktop users might prefer more traditional methods such as email - although this is rapidly changing as emails are equally accessible on modern mobile devices. Another possible application of social media data and device data, is to investigate the relationship between the time of day when communication occurs and likelihood of obtaining a promise-to-pay. In sum, collection agencies could investigate augmenting their existing data with additional data sources, which include social media data and other online behaviour, geo-location data, device data, and data provided by data brokers. These data sources can be used to augment the scoring of debtors and the determination of appropriate collections strategies. Scorecards, such as those used for credit card applications, have traditionally employed the statistical method known as logistic regression. An introduction to the methodology commonly used during scorecard building is provided by Siddiqi8. Scorecards have some similarity to collection queues as both involve estimates of an individual's ability to pay. Logistic regression does, however, have very specific weaknesses (e. g. assumption of linear relationship between the logit of the target variable and other explanatory variables). Machine-learning techniques are frequently used to overcome the limitations of logistic regression. Challenger models, based on machine-learning techniques, might outperform traditional techniques when the assumptions of those traditional techniques are not appropriate. Currently, most collection agencies in South Africa use either expert knowledge or logistic regression or a combination to model collection aspects. For example, in an industry directed research project that was done for MBD in 2007, a collections scoring model was developed using logistic regression. 9 Another industry directed research project that was done for Absa Bank in 2012 also used logistic regression to develop a collection scorecard. 10 An additional example is a project done for Shapiro Shaik Defries & Associates in 2017 which also revealed (via the personal observation of A. B. ) that this perception exists in South Africa. The same observation was made by DMC Debt Management (Myburgh S, 2018, email communication, February 1), that is, that most of the collection agencies in South Africa use either expert knowledge or logistic regression (or a combination). The field of machine learning has seen a significant growth in industry interest over the past years. 2 Machine-learning techniques are applied to social media data in the literature and it is reported that the unstructured nature of the data, as well as some applications which require unsupervised learning, were significant contributors to the choice of using machine learning. 2 The most frequently employed techniques were support vector machines, classification trees and Bayesian networks. An important result to note here is that no single machine-learning technique will consistently outperform all others in all contexts. A summary of innovative uses of machine learning and other statistical modelling techniques is provided in Table 4. It has been argued23 that the use of machine learning has many possible advantages for debt collectors. Several considerations when building collection queues are raised by Davey24 which could be easily solved by using machine-learning techniques. For example, a typical trend experienced by collectors is that debtors increasingly prefer to repay their debt over long periods of time rather than once-off or over short periods. Such a repayment structure requires the modelling of payment streams, in both amounts and timing. Consequently, the models used to score debtors need to take the collections period into account, as it is a significant factor affecting operational profitability (increased costs and time value of money). One of the abilities of machine-learning techniques is to find deep patterns in the data, which humans cannot reasonably be expected to identify. A critical point raised is the need to recalculate debtors' scores as regularly as possible24, as new data might become available which are not accounted for by older scores. Real-world results reported by Davey24 for companies using First Data's PREDIGY® which is based on machine-learning techniques include a financial institution which reduced their losses on delinquent accounts by USD2. 1 million and a management agency which increased their collection agents' performance by 18%. Note that these specific results do not convey any details on the specific machine-learning technique used, but generically refer to it as 'strategic predictive analytics'. 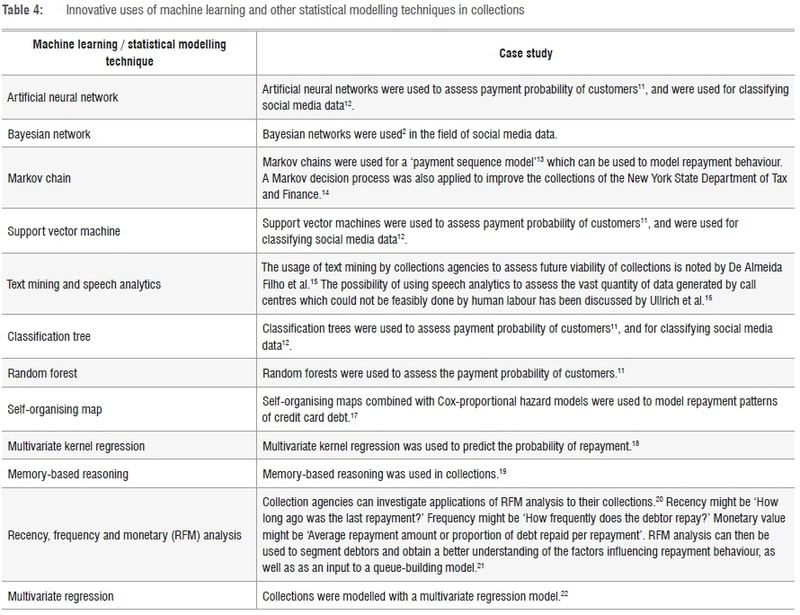 Additional studies25 used machine learning and other statistical techniques to increase debt collection. It might be of interest to collection companies to know which variables are typically used. Examples of the variables include financial ratios (e. g. age of account, size of account, size of repayment, liquidity of debtor); qualitative factors (e. g. account's business nature, market outlook); and behavioural factors (e. g. account transactions, balances, wallet priority). In many cases it might be possible to quantify the monetary implication of a superior model. One such example is an interesting case study in which three machine-learning techniques (artificial neural networks, classification trees and memory-based reasoning) were compared with logistic regression. 19 These techniques were applied to a list of debtors whom the firm had declined to collect on. Their results showed that approximately 35% of these accounts were classified by the best model as 'good', indicating that the firm had probably misclassified a significant proportion of 'good debt' as 'bad debt' in their records. The unrecovered debt associated with these misclassified accounts totalled USD423 000. In this case, the logistic regression outperformed these three machine-learning techniques. As mentioned in Table 4, multivariate kernel regression has also been used to predict the probability of repayment and infer the strengths of the relationships between the predictor variables and the response. 18 Some of the results included that homeowner status and self-employment status were not significant while bank account holding status was significant. The most interesting result of this study is that intuition might not necessarily be supported by the data. As an example, whilst it might be intuitive to assume that homeowners have better repayment behaviour than non-homeowners, this assumption was not supported in the analysed data. Therefore, it is strongly recommended that South African collection agencies evaluate the predictive performance of the data used to create collection queues and ensure that expert-based systems are also supported by data. The specific case study referred to in Table 4 that used a multivariate regression included a thorough analysis of the variables that can predict collections. 22 Data obtained from the German market, relating to more than 150 000 accounts from 78 creditors, were used to build a multivariate regression model. Again, it might be of interest for collection companies to know which variables were used, as a common challenge in modelling is identifying and acquiring appropriate input. In the German study,22 the main variables that played a role in predicting collections were: exposure at default; age of account (fewer collections on older accounts); previous experience in collections; macroeconomic factors (unemployment rate for country and GDP growth); legal nature of debtor (corporations tend to have better repayment than individuals); intensity of customer complaint (an increase in intensity associated with lower collection rate); repayment method (instalments versus once-off) and bankruptcy (collections on accounts by debtors formally in bankruptcy were significantly lower). To summarise, we found that different modelling techniques have been successfully used in collections. Some of these techniques include artificial neural networks, support vector machines, classification trees, random forests, Markov chains, text mining, self-organising maps, multivariate kernel regression, 'recency, frequency and monetary' analysis, and multivariate regression models. After analysing debtors and creating collection queues, the queues are assigned to agents who then communicate with debtors and attempt to collect as much as possible on the accounts in arrears. A summary of innovative ways to enhance collection strategies is provided in Table 5. According to Melo31, a representative of the analytics software company FICO, the collection strategies of the future will make use of digital, automated communication. Melo's results showed that debtors prefer digital, automated interaction to agent-based interaction. Taking this result into consideration, and the fact that South African collection agencies typically perform the majority of their communication through call centres, for which personnel salaries account for up to 70% of collection costs27, innovative ways to enhance call centres are required (and possible ways are provided in Table 5). Innovative ways to enhance collection strategies include the use of machine learning, optimised scheduling, app-based solutions, avatars, interactive websites (online debt collection), real-life stories and ringless voicemail drops. When considering these developing trends, it is reasonable to assume that the collection strategies of the future will mostly utilise digital, automated communication. A collection strategy encompasses the communications strategy, write-off strategy, queue assignment and more. The integration of the collection strategy with debtor scores and, consequently, the dependence on the data sources and models used to generate these scores greatly increase the challenge in fair and practical evaluations. The importance of accurately assessing collection strategies can be summarised by the phrase 'you can't fix what you don't know is broken'. Objective evaluation and comparison of multiple collection strategies is a common challenge faced in the collections industry. 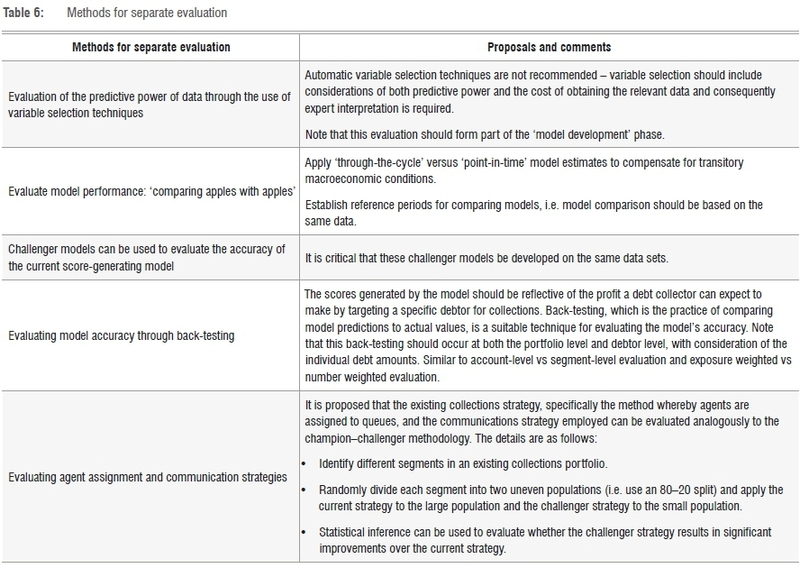 Such evaluation requires an assessment of the model's performance and an unbiased comparison of the efficiency of multiple collection strategies. Causes of bias might include the application of different strategies to different debtor demographics or during periods of different macroeconomic circumstances. There are two factors to consider when evaluating collection strategies. Firstly, before comparing the performance, it is important that macroeconomic factors be taken into account when the collection strategies under comparison are implemented at different times, as macroeconomic factors affect collections. 22 Secondly, it is also crucial that the performance evaluation criteria for a strategy be specified in advance, before the strategy is implemented. Some innovative ways to evaluate strategies are given next. The first innovative way to evaluate such strategies is the use of speech analytics software36 to analyse the large volume of telephonic conversations and associated data which are generated by call centres16,37. Because it is impractical for managers to listen to every phone call, a digital solution capable of identifying the quality of a phone call is a practical alternative. Two companies which offer commercial products capable of speech analytics are Nexidia's software analytics and CallMiner. We recommend that South African collection agencies investigate the usage of speech analytics to analyse debtor-agent interaction and identify key phrases associated with good and bad repayment behaviour. Different approaches to speech analytics are available. 38 As significant research has been done in text analytics, the usage of speech-to-text software is proposed as a method to obtain the necessary data for analysing automated collection strategies. Secondly, a specific best practice when evaluating a collection strategy is the use of a champion-challenger strategy. Based on the literature, it is clear that separate evaluation of the critical components mentioned earlier is possible, as described in Table 6. • Collection agencies should consider broadening their communications strategies to include social media and digital platforms (such as applications). User interaction with such platforms generates data, which could also be used to profile debtors. • When debtors are business owners, web-mining techniques can be used to extract data directly from individual websites. Such cases, however, might be sparse, and consequently a cost-benefit analysis of such an undertaking is advised. • We emphasise that the predictive power and legality of any data need to be carefully assessed before data are included in any model, especially data sources from data brokers who collect data from several different domains, such as corporate (employment history, qualifications, etc. ) and civil (dependants, marital status, etc. ) records. • Several social media data vendors are active in the developed world, most notably in the USA and UK. These firms provide data streams of social media data, aggregated across multiple platforms and filtered to an extent. Communication with one of these firms revealed that privacy legislation might impede the usage of such data sources to profile individual debtors. Because of these restrictions, we cannot advocate for the use of social media data, as provided by these vendors, at the current stage. 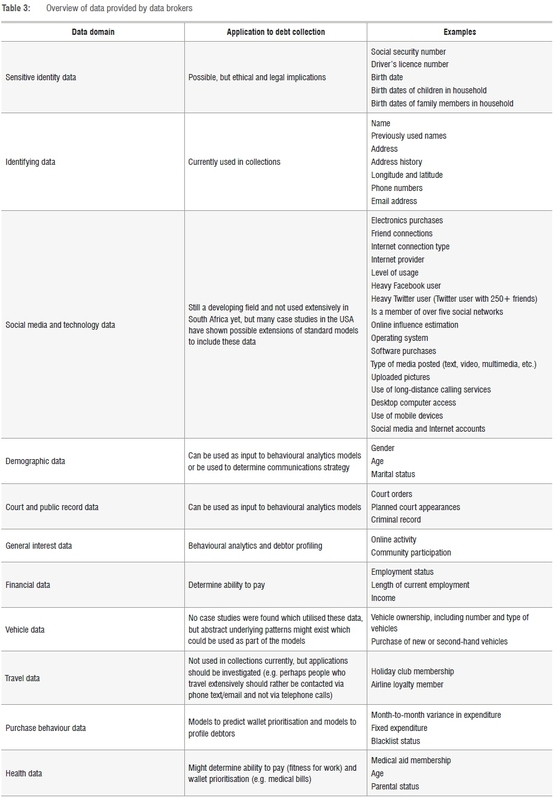 Social media data, as they are currently available, may only provide a general overview of debtor demographics and high-level segmentation (such as analysing debtor repayment behaviour for rural versus urban debtors). A notable exception is mobile phone data: despite the prevalence of mobile phones, no studies could be found which utilised mobile phone data for collections. Despite this fact, we are of the opinion that South African collection agencies should investigate the use of mobile phone data in this context. • As traditional techniques can be implemented relatively quickly and at low cost, it is recommended that these be used as a baseline. • A critical examination of the validity of the assumptions underlying these models is advised. Should these assumptions be violated, remedial measures need to be taken. Should remedial measures not suffice, it is suggested that alternative techniques be investigated. • When highly non-linear or abstract patterns exist in the data, machine-learning techniques such as artificial neural networks have been shown to outperform traditional techniques. • No single modelling technique will outperform all others in all contexts: consequently, the usage of champion-challenger strategies is advised. • Models can be built from the outputs of more than one technique; for example, a classification technique could be used to identify segments of similar debtors, thereafter a logistic regression model could be used to estimate individual debtors' probability of payment. The collections strategy can then be aligned to the debtors' segment, whilst an agent can be allocated according to the estimated probability of payment. • Existing models should be used, not only for collections, but also for statistical inference so that data-driven understandings of operations can be obtained. •Collection agencies should investigate offering longer pay-back periods to debtors, in conjunction with the agency's clients. • Mobile applications have grown in popularity, and studies have shown that an increasing number of consumers use these apps for business. Collections-specific applications already exist and have been well received by debtors; it is reported that these applications also improve collection rates and agent productivity. It is recommended that collection agencies investigate the development of a mobile application for usage by both debtors and agents, as it can provide an easily accessible, innovative and standardised platform for collections and communication. • Studies have shown that the performance of call centres can be accurately assessed using speech analytics. It is recommended that a cost-benefit analysis be performed to evaluate whether existing software should be licenced for this purpose. • The usage of avatars for communication purposes has been shown to be effective in reducing the stigma associated with bad debt, thus easing the communications process. It is advised that the usage of avatars for guiding debtors through the collections be investigated experimentally. •Several different assignment strategies of agents to collections queues are possible, and recommendations in this regard are provided in the section titled 'Innovative ways to enhance collection strategies'. • Linear programming - a commonly used method in decision support - can be utilised to optimise agent scheduling for call centres. •Collections strategies of the future will most probably pivot towards digital, automated communication. • It is critical that the collections strategy (queue-building model, business rules, etc. ) used at any specific time be well documented to allow for fair comparisons of the performance of different collections strategies. • The metric used to assess the collections strategy's performance - such as collections rate, collections period or collections cost - needs to be specified upfront. • When assessing the performance of two different collections strategies, it is necessary to make sure that a valid comparison is made. 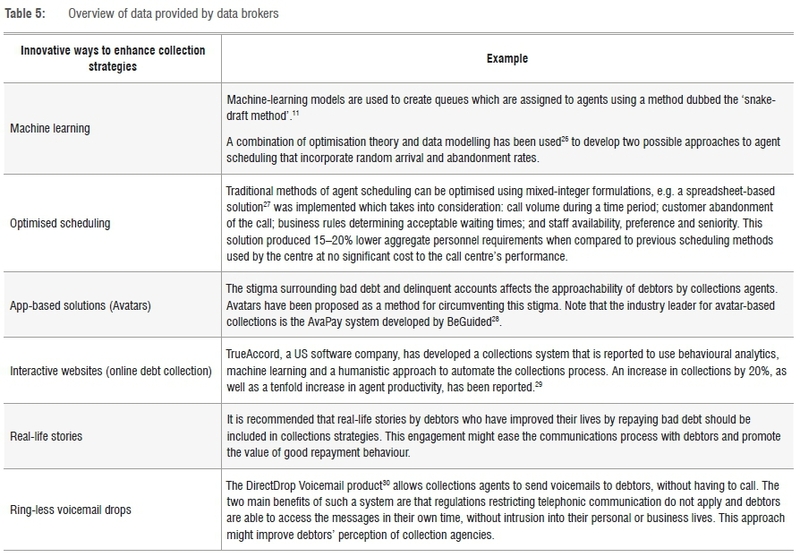 For example, investigate the debtor profiles of the two different collection strategies. Also, the specific time period could be compared to determine a valid comparison (different macro-economic scenarios can make two strategies incompatible). Champion-challenger strategies are commonly used to evaluate and improve model performance. The implementation of these recommendations will be critical to ensuring that South African collections agencies operate profitably, ethically and in line with international standards. Research on cutting-edge innovations for collection agencies was summarised. Key phases of the collections cycle were identified, and critical aspects of those phases were researched to determine the latest developments. A comprehensive overview of the research findings was provided and theoretical studies, as well as practical applications through case studies, were included. The understanding of the literature and the collections industry in general was used to identify possible applications of these findings to South African collection agencies and recommendations were provided. It is clear that the field of collections is a complex one, but several slight improvements in the various aspects of a collection agency's operations can, in aggregate, produce significant improvements to the efficiency and profitability thereof. The collections strategies of the future will most likely mature into digital, automated interaction. The recommendations will most probably find their way into future best practices of the collections industry. • The development of an operation evaluation strategy, comprising methods for the evaluation of all relevant aspects affecting a collections agency's performance, i. e. evaluation of data sources, score generating models, agent assignment strategies, communication methods, etc. • The development of industry specific back-testing techniques. • Investigation of the state of South African debt collections agencies with respect to the recommendations made in this paper. V. B. : conceptualisation; methodology; data collection; data analysis; validation; data curation; writing revisions; project leadership. T. V. : conceptualisation; sample analysis; data analysis; writing the initial draft; writing revisions; student supervision; project management. A. B. : conceptualisation; methodology; project leadership.